but I don't know how to replace the data on tableau server. I have cofused a lot. First create extract and do dashboard creation. After completion of dashboard then publish to server with some extract refresh schedule. Based on schedule data will update in server. Publish the datasource as the same name which is on server it will ask to overwright with existing one. Please make sure you have a earlier published as a datasource not like emeded datasource in the workbook . should I replace data source on tableau desktop? is this I had replaced? Please see below link how to replace the data source.. 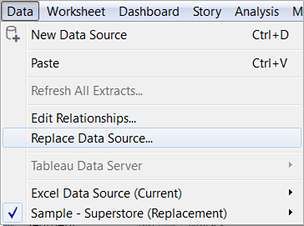 If you want to replace datasource in workbook itself. Open a workbook that connects to the original data source. Select Data > New Data Source and then connect to the new data source. On the Data Source page, drag a table to the canvas to set up the data source (if this is not automatically done for you). 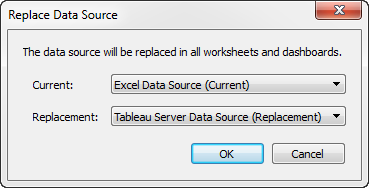 Go to the sheet tab and select Data > Replace Data Source. Note: You must have at least one field in the view to make the Replace Data Source option available. All worksheets, dashboards, and stories that used the original data source are updated to use the new data source. You can click Undo on the toolbar to revert the change and return to the original data source. Let me know if you are still having trouble or looking for something else. I set the refresh schedule, but it shows failed to refresh. I don't know if the reason is that my authentication is none. however, I can't edit connection in this page to change the authentication.